I seem to be having an attention-love affair with the Adaptive Path team lately. Alexa Andrzejewski has a great post about involving conference participants in the themes and conversations at their recent MX Conference. Alexa documents some of the ways she’s seen at past conferences for allowing the audience to self-organize and “triangulate” around. Graffiti Wall: Put up a giant piece of paper with some initial structure and encourage collaborative graphic recording — where participants can add their own notes, sketches and insights to a giant mural. Stickers and collaging images and words could be provided as well. Open Whiteboards: Write questions on giant sticky notes (e.g., “What is service design?”) and put them in the halls where people can write on it during breaks. It could give people something to talk about while providing a forum for expression. Five Minute Madness: We do this in our staff meetings: Someone makes an audacious statement that they may or may not agree with (e.g., “Experience Designer is a meaningless job title.”), and we discuss it for five minutes. Something like this could also be done on giant pieces of paper. Projected Messages: Have a computer hooked up to a projector where people can type (or Twitter) ideas and thoughts and see them projected. Providing a question or conversation prompt, as described in Open Whiteboards and Five Minute Madness, might encourage participation. Birds of a Feather: Place a “topic card” on each of the dining tables, such as “design research” or “managing internal experience teams” and encourage people to find a table with a topic that interests them. I love the bottom up theme discovery. Events like the Sarah Lacy/Mark Zuckerberg SxSW debacle hopefully are the exception for how to rally conference attendees. I’m not sure how these are different other than the surface. 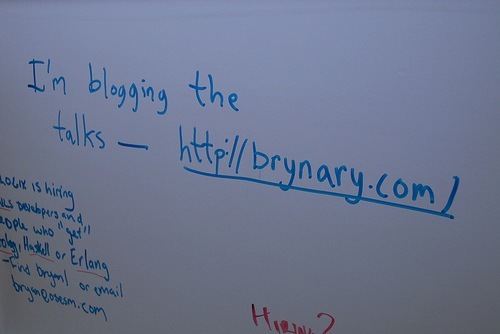 Perhaps it’s the intent of what people are supposed to do with graffiti versus whiteboards. It’s a great idea to place the whiteboards or graffiti wall in a central location, i.e., near the coffee or just out of the traffic flow between sessions. Basically the placement needs to be where conference attendees congregate. Also make sure there are lots of markers and materials for creative expression this includes word magnets and other forms of self-expression. I really like the idea of using large butcher paper placed around the conference. This reminds me of the 20×2, MiniBarCamp or Ignite ideas. 20×2 is a concept curated by Kevin Newsum and Jeff Rider. At SxSW, 20 speakers get asked to take 2 minutes to answer 1 question. The format allows a diverse group of participants to approach a common idea space. The questions are designed to be dynamic and open ended. The questions covered are esoteric, interesting and open-ended. Designed to inspire the audience and the responses. The Ignite format is pretty simple. Presenters have 20 slides, the slides advance automatically every 15 seconds. This limits the presentations to 5 minutes (20 x 15 seconds = 300 seconds). The rules become an interesting mechanism for self-expression. Other formats that for a social event include Powerpoint Karaoke. Not as much about conference feedback, but a great way to get conference participants engaged and sharing. One option for Powerpoint Karaoke is to have the audience represent the slides from the main conference. It could be done in a recap format or in a completely humorous spoof of the presentation. 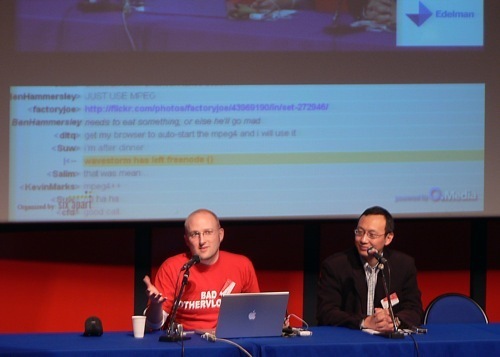 Jesse Hirsh displayed a Twitter-based backchannel at his “Permanent Campaign: The impact of technology on politics” event. This is not a new idea. ETech has had the IRC-based backchannel for as long as I can remember, but it hasn’t been projected. 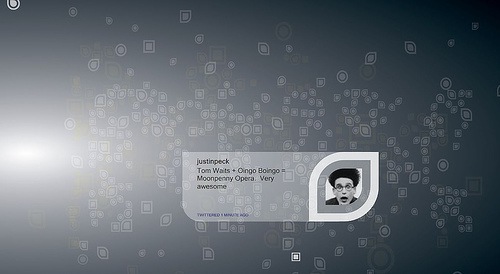 Les Blogs projected an IRC-based backchannel in 2005 to very mixed reviews. Other less technical options include web-based chat like Pibb which the BarCampPaloAlto folks used in conjunction with Jyte for voting and assertions. Mix07 used Flittrbook to display a mashup of Flickr, Twitter and Facebook messages. Figuring out how to integrate the backchannel into the conference is a tough challenge. One thing that needs to happen at EnergizeIT, Mesh, or any other conference is that presenters need to be able to see the backchannel without having to turn around to see the screen. Whether it’s self-selection into groups or providing common topics for the group to collaborate on, it’s important to encourage attendees with similar interests to discover each other during conferences. My hypothesis is that conference experiences are strengthened by the personal connections made or renewed at the conference. The Community Connection events are a structured evening session aimed at facilitating discussion among participants. The Learning Circles [PDF – 154kb] are a context for sharing ideas, views and experiences in a participatory conversational format. These BOF and Learning Circle engagements are incredibly powerful community tools that have been leveraged by organizations, unions, churches and movements to galvanize members into addressing concerns through dialogue and taking action. Whether it’s participant-driven conferences, or providing tools for feedback at other conferences, engaging the audience and giving them the opportunity to connect and share is key to having a successful conference. 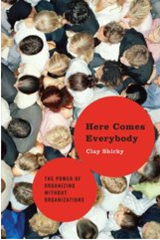 Clay Shirky’s new book puts forth an interesting hypothesis, “for the first time in human history, our communications tools support the group conversation and group action”. Conference need to continue to investigate how to use tools to improve the connections between attendees. There are bound to be a set of new patterns that emerge for engaging attendees. We’re seeing the integration of participant-driven content into conferences like Mix08 (Open Space @ Mix08) and Web2Expo (Web2Open). The addition of tools like CrowdVine, Facebook and others maybe we can start to find each other and build better conference experiences.